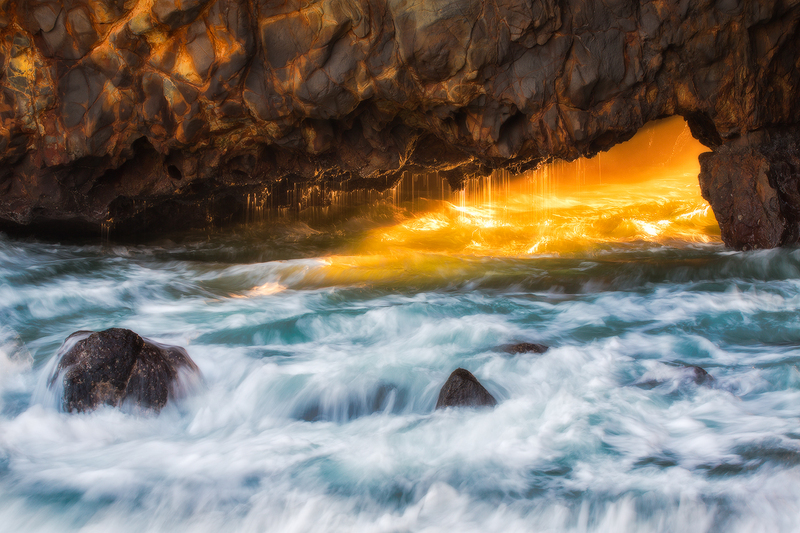 My friend David Thompson and I were exploring a cove near Los Angeles when we came upon this sea cave. As it was close to sunset, golden light was flooding in from the other side, so we wasted no time in setting up for our shots. It was one of my first outings using the TVC-24L on the coast, and it proved to be extremely stable, even with waves rushing by. The 24L version, having longer legs, was also quite versatile in situations where I’d need to stand on a boulder, but had to have one or two of the tripod legs in the water. Having the full RRS L-plate/ballhead/tripod setup allowed me to quickly transition from one composition to another and really maximize working the scene until the light began to fade. That’s a great image from Paul. It’s one of my favorite of his. I’m so stoked that one of my friends is getting acknowledged for his artistic work! Lovely image; it almost vibrates. Well done! Paul, really a super shot! Thank you for sharing both the image and write-up. The back-lit dripping water is magical. Joe Sr.